Fuzzy Wigglers are a rare type of Wiggler from the game Yoshi's Story. They only appear in Stage 1-2: Surprise!!. Fuzzy Wigglers resemble their normal counterparts, except they are green in color, covered in fuzzy hair, and have mushrooms on their heads in place of flowers. These Wigglers are made up of five segments, including the head, and can only be defeated by stomping each section. After a segment has been jumped on, it will turn purple. Unlike normal Wigglers, Fuzzy Wigglers do not get angry when jumped on, and will simply keep walking. After all five sections have been turned purple, the Fuzzy Wiggler will dissipate, leaving behind a Melon. 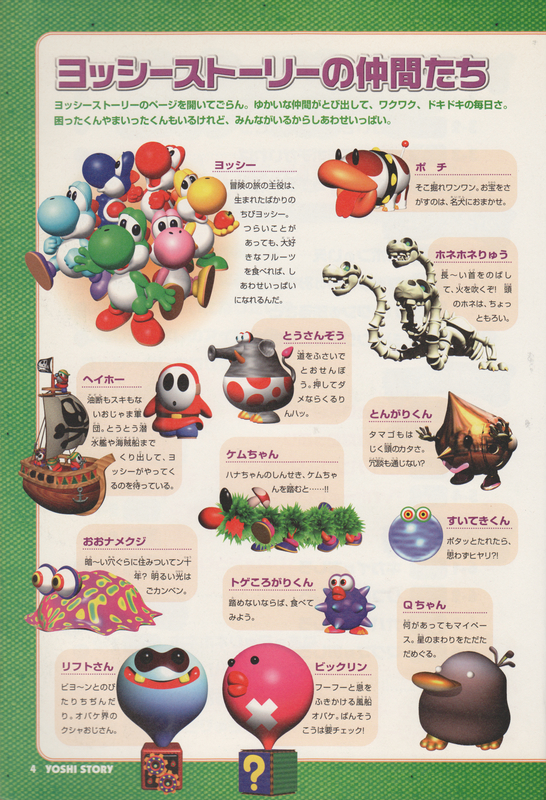 ↑ 「ヨッシーストーリー 任天堂公式ガイドブック」 (Yoshi's Story Nintendo Kōshiki Guidebook), page 4. This page was last edited on June 23, 2018, at 10:34.